Pepper is a rambunctious big man, minor-league troublemaker, working-class hero (in his own mind), and, suddenly, the surprised inmate of a budget-strapped mental institution in Queens, New York. He's not mentally ill, but that doesn't seem to matter. He is accused of a crime he can't quite square with his memory. In the darkness of his room on his first night, he's visited by a terrifying creature with the body of an old man and the head of a bison who nearly kills him before being hustled away by the hospital staff. It's no delusion: The other patients confirm that a hungry devil roams the hallways when the sun goes down. Pepper rallies three other inmates in a plot to fight back: Dorry, an octogenarian schizophrenic who's been on the ward for decades and knows all its secrets; Coffee, an African immigrant with severe OCD, who tries desperately to send alarms to the outside world; and Loochie, a bipolar teenage girl who acts as the group's enforcer. Battling the pill-pushing staff, one another, and their own minds, they try to kill the monster that's stalking them. But can the Devil die? 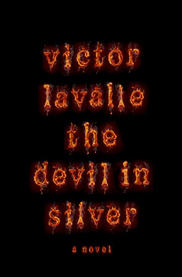 The Devil in Silver brilliantly brings together the compelling themes that spark all of Victor LaValle's radiant fiction: faith, race, class, madness, and our relationship with the unseen and the uncanny. More than that, it's a thrillingly suspenseful work of literary horror about friendship, love, and the courage to slay our own demons.